Android data loss issue is not a rare situation. Many of you may face this issue anytime and anywhere. When this issue happens to you, most of you will try to find a way to recover the lost data. However, after you searching this issue on the internet, you will discover that you have to root your Android phone and tablet in advance, and then you will be able to recover data from the Android device directly. Here comes the question: is it possible to recover deleted files Android unrooted? The fact is that if you want to recover deleted data from your Android phone or tablet directly with a third-party tool, you have to root the Android device in advance. Otherwise, the software will be unable to detect all the data on the device. However, you should also know that Android data can also be saved on the inserted Android SD card. If you want to recover data from Android SD card, you will not have to root the SD card in advance. That is to say, to recover deleted files Android unrooted is possible to a certain extent. 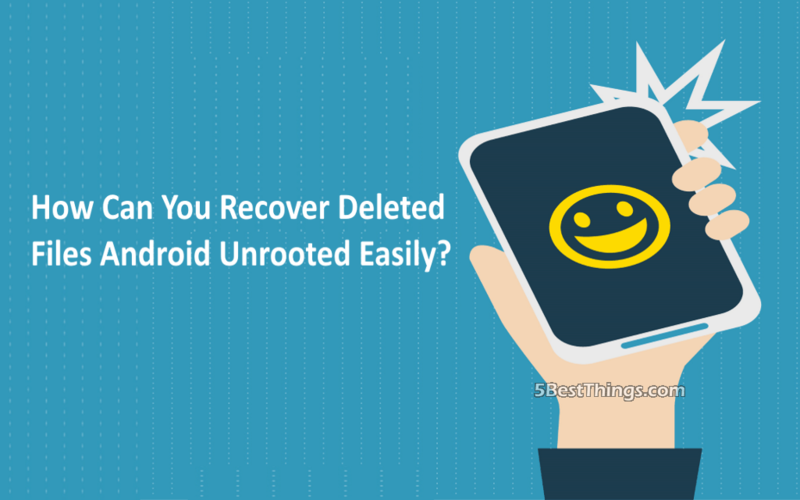 Next, in this post, we will show you how to recover deleted files from unrooted Android with a piece of third-party data recovery software for unrooted Android. Please keep on reading. How to Recover Deleted Files Android Unrooted? MiniTool Mobile Recovery for Android is the exact software which we will introduce to you today. As a matter of fact, this software has two recovery modules: “Recover from Phone” and “Recover from SD-Card”. With these two modules, you can recover your lost messages, photos, contacts, call history, videos, and more from Android phone & tablet and SD card. 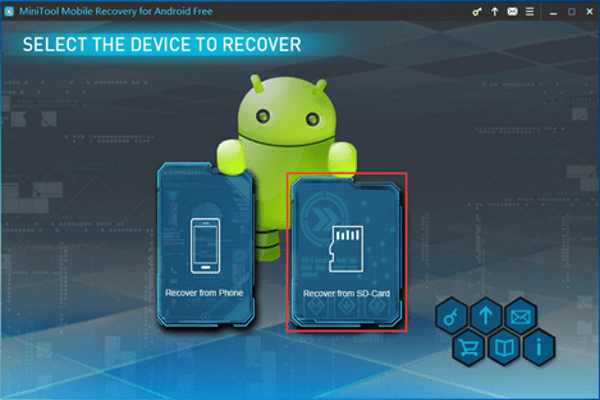 To recover data from Android SD card, you should use its “Recover from SD-Card” module. The Free Edition of this software enables you to recover ten pieces of one type of data each time. So, you can download and install this freeware to your computer to have a try. Here, you should know that this software can be operated on Windows 10/8.1/9/7. Then, the following guidance will show you how to recover deleted files Android unrooted with this software. Firstly, you should insert the Android SD card into an SD card reader, and then connect the SD card reader to your computer. 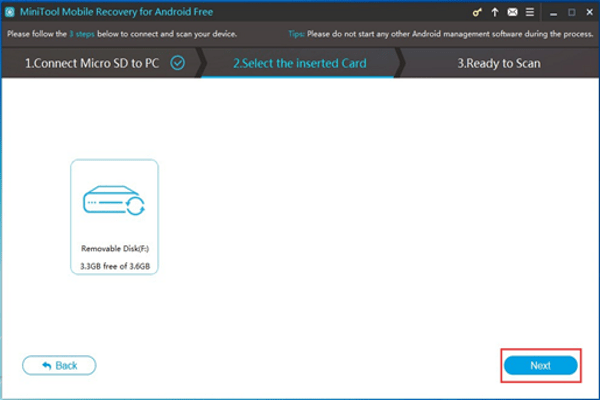 After opening the software, you should click on “Recover from SD-Card” module to continue. Secondly, the software will detect the Android SD card automatically. Here, you should press “Next” button to start the scan process. Thirdly, after the scan process, you will enter the scan result interface as follows. You can see the data types are listed on the left side. Next, you can choose one data type and view its result on this interface. If you only want to view the deleted items, you can switch the blue button “OFF” to “ON”. Then, you can check the items you want to retrieve and click on “Recover” button. Fourthly, there will be a pop-out window with the software default storage path. You can click on “Recover” button to save these selected items to this path directly. Or, you can click on “Browse” button to select another path to store these files. At last, you can find the recovered data on the specified path on your computer. If you want to use this software to recover more data without limitation, you can choose to update this freeware to an advanced version. 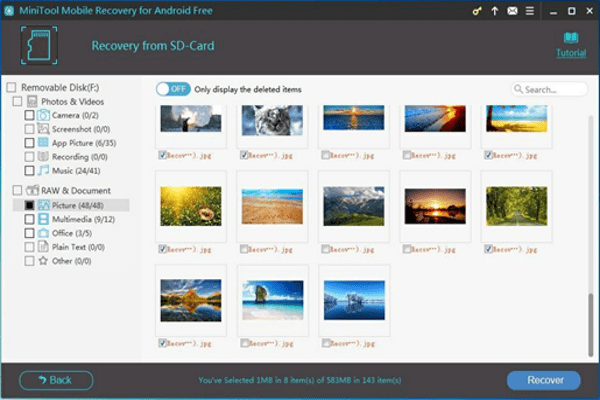 This software is not the unique choice for you to retrieve deleted data from Android SD card. With MiniTool Photo Recovery, you can recover your lost and deleted photos and videos from Android SD card; and with MiniTool Power Data Recovery Free Edition, you will be able to retrieve 1GB data. You can choose one MiniTool program according to your own situation.